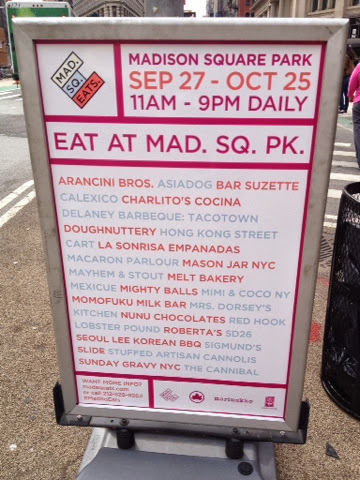 Twice a year, food vendors come together under tents in Madison Square Park for a month long food fair. This season it's open September 27-October 25 daily, 11AM-9PM.. I finally got around to it at its half-way mark. It didn't disappoint. It depends on what caliber of fat you are, but for me, I can drop a heavy penny on tasting multiple snacks from all the vendors. My advice? Do a lap, scout out the menus, and hoard your selections at a table if you can get one. There's something special about packing a tiny table with endless international food items that don't mix, and it will surely lead to your inevitable bout of diarrhea. Still with me? 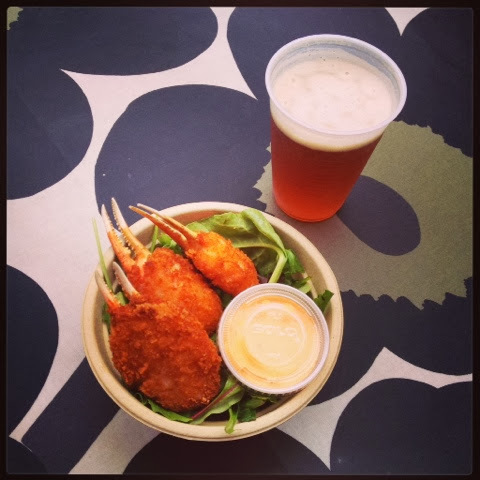 I started at Hong Kong Street Cart for breaded, deep-fried snow crab claws. Three for $10. Kind of pricey for me, but it was pretty amazing dipped in the spicy sauce. I washed it down with a Smuttynose Pumpkin Ale ($9) from The Cannibal. After this round of food I knew I'd have to get thrifty and budget myself. Chase bank is so ready and willing to text me a notification that I've hit rock bottom in my checking account...again. 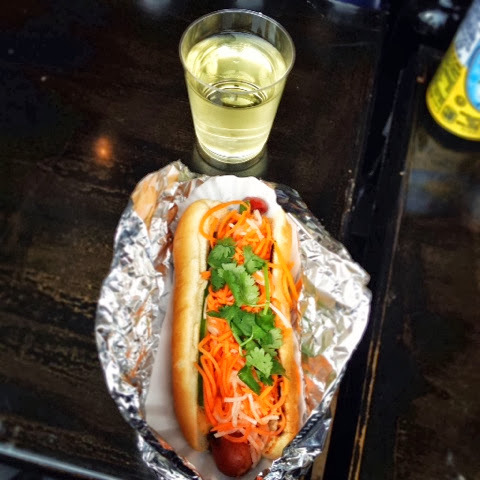 Next stop, Asiadog, for a Vietnamese bâńh mì hot dog ($6). Whoa. I started feeling full (probably the beer) so I pinched some tin foil around half that dog and put it in my pocket for later. I got some backup. A friend came on down for her lunch break to meet me. 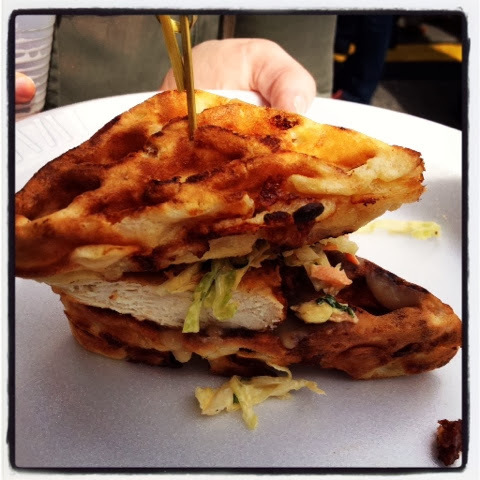 We went to Slide for a fried chicken and cheddar waffle slider ($6). A little dry, because I think I missed the bite with the cole slaw and pear marmalade at first, but delicious. 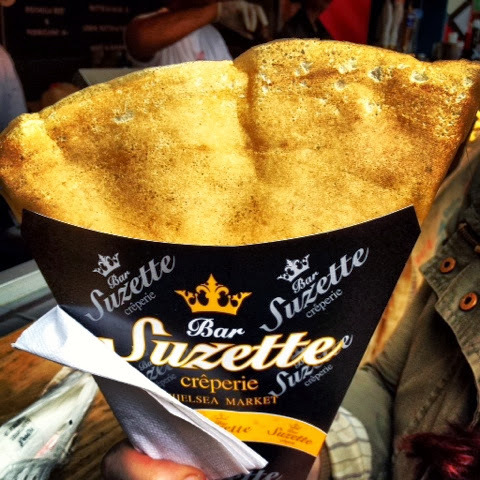 The truffle mozzarella crepe from Bar Suzette was scary good ($8). 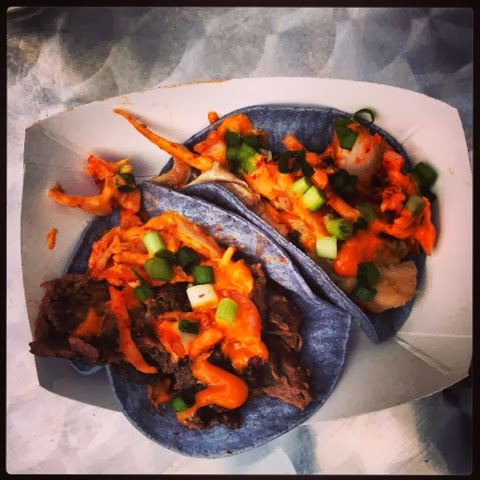 We made our way to Seoul Lee Korean BBQ for a chicken sesame taco and a bulgogi beef taco ($3 each). Drooling. Also gassy now. 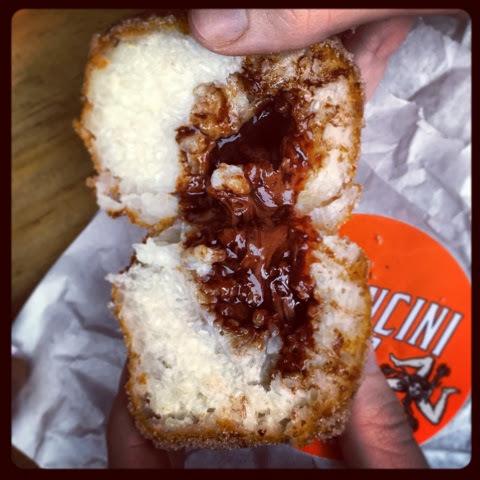 Finally, a Nutella rice ball from Arancini Bros ($3). A sugary sweet ending. The center was rice pudding with a dollop of Nutella, and the crispy exterior was rolled in cinnamon and sugar. It was all washed down with a Greenport Harbor Brewing Co. Black Duck Porter from The Cannibal ($9). New York City, why do you taste so good?